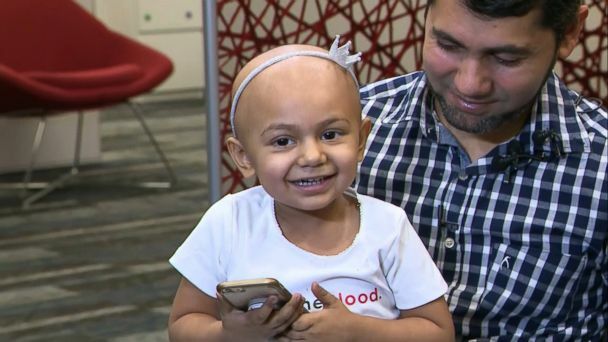 The organization leading the worldwide search to find units of a rare blood type for a 2-year-old desperately in need of life-saving cancer treatment has received a "tremendous response" to the family's public plea to locate donors, a representative told ABC News. OneBlood has received 12,000 emails alone since releasing a campaign Monday to locate donors for a type of blood so rare that less than 4 percent of people on the planet possess it, Susan Forbes, vice president of marketing and communications for OneBlood, told ABC News. "The world is really rallying around this little girl to try and find some compatible blood for her," Forbes said. Before Zainab Mughal's story was made public, the family held local blood drives near their home in Miami in an effort to find a match, Forbes said. When no matches turned up, the team decided to "cast a wider net," Forbes said. Zainab, who was diagnosed with high-risk neuroblastoma about two months ago, is missing a common antigen in her red blood cells known as Indian-B, her parents, Raheel Mughal and Mariam Mehmood, said in an interview Thursday. Because the antigen is so common, it's difficult to find blood donors who don't have it, Forbes said. In addition, the donor will need to be of Pakistani, Indian or Iranian descent, and have blood types "O" or "A" to be a match, Forbes said. No one in Zainab's immediate and extended family has been a match. Mughal and Mehmood knew their daughter was seriously ill due to constant fevers and constipation as well as a mass that had grown on her stomach while her arms remained skinny, they said. After Zainab was diagnosed, doctors did not have a single unit of blood in stock to transfuse her, Mughal said. So far, OneBlood has located three matches, including one in the United Kingdom near London, with the help of the American Rare Donor Program, Forbes said. All three have since sent units of blood to the Miami area, where the family lives, Forbes said. But it's still not enough, Zainab's parents said. Zainab will need about seven to 10 donors who can stagger blood donations for the course of her treatment, Forbes said. Zainab will also have to undergo two bone marrow transplants because her cancer has spread to her bone marrow, the family said. The transplants will make her stronger and allow doctors to give her higher doses of chemotherapy, Forbes said, but they currently only have enough units for one surgery. Without a second surgery, Zainab will have a higher chance of relapsing, her father said. Mughal and Mehmood have a "strong faith" that Zainab will make it because of the strength she's displayed throughout her illness. Even after the fourth round of chemotherapy, she was still active, smiling and playing, her mother said. The only time Zainab's spirits are low is when she goes to the hospital because she knows she'll be poked and prodded by needles, Mughal said. The search to find blood for Zainab is an "industry-wide" effort within the blood banking community, Forbes told ABC News. "Every blood center in this country is trying to find compatible blood for this little girl," she said. In addition, Zainab's case is "bringing awareness" to others who may be lacking the Indian-B antigen, and identifying them and adding them to the rare donor program will be a "wonderful thing, not only for Zainab but for future people also in the same situation as her," Forbes said. Mughal urged well-wishers to go out and donate blood, describing his daughter's need as a "death-and-life situation." "Everybody who's listening, please go out and do donate the blood," he said. "Your blood is not gonna be wasted."